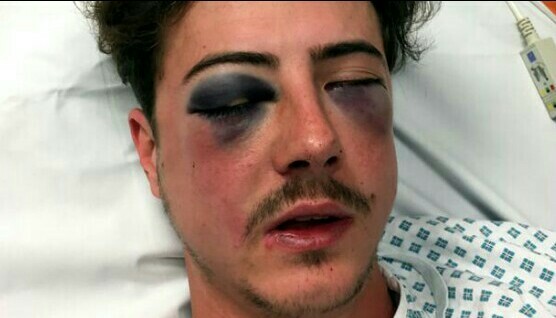 Doctors fear a Tottenham Hotspur fan could be left with permanent damage to his eyesight, following an attack in which police think a fellow Spurs fan mistook him for a Chelsea supporter. Michael Voller was assaulted after his team’s FA Cup semi-final defeat by Chelsea on Saturday at Wembley. He was set upon after the match outside an Indian restaurant near the stadium. He was punched in the face and suffered a broken skull and damage to his cheekbone and eye-socket. Mr Voller had been walking with a group of friends past Moore Spice Indian restaurant on Engineers Way at about 19:30 BST, The Met Police said. “It is believed that one of the group has then mistaken Michael for a rival Chelsea supporter and punched him in the face, leaving him injured,” the force said. The 23-year-old, who had previously worked as a gardener at the north London club’s training ground, has been discharged from hospital but doctors said they were concerned there may be lasting damage to his eyesight. Det Con James Robb described it as a “violent and unprovoked assault”. The suspect is described as a white man, aged in his early 20s and approximately 5ft 10ins tall. He was wearing a black hooded top or jacket.